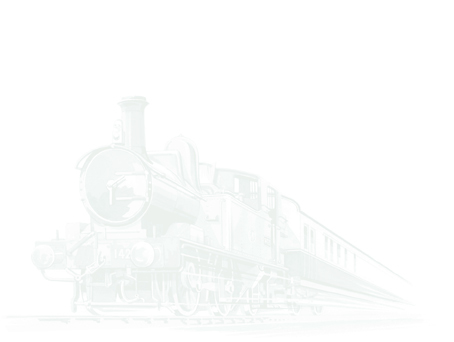 On Monday 21st January the loco had its No.1 bogie brake blocks changed. 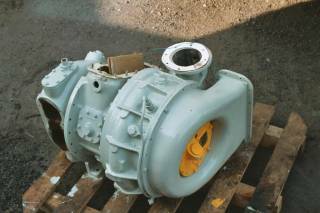 The compressor had its oil changed in mid February and the tappets were adjusted on Sunday March 3rd, ready for a spot of ballast dropping (some 600-700 tons) later in the month. The No.2 bogie brake blocks were changed on Sunday 17th March. This is the first re-blocking for the loco in ten years. During the last week of March a compression test was carried out on the power unit and B2 cylinder was found to be on the low side and so this will be watch over the coming months. wash and polish after a winter on dust in, under cover. Mid afternoon a test run was made to Bishops Bridge on the rear of a goods train and then returned light diesel. A small coolant leak was found on a hose at Bishops and put right their. Also noted was that the control air would build up passed 70psi, which means a sticking valve. The sight glasses on the turbo off the spare engine will have to be cleaned in the coming weeks, as seeing the oil level is very hared. The cab to cab phone has been refitted, but it does not work. 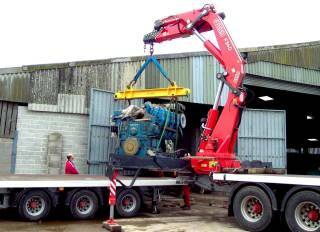 Both class 20 should now be ok for the AGM of the Devon Diesel Society at the start of April. The No.1 cab has come together very well, and by the start of February was just waiting the seats to be refitted. Both cab floors are still in a poor state, as they both need new thick plywood along with a new floor covering. A start was made in mid February to unbolt the cooler group and loosen off the roof retaining bolt ready for the lifting out of the radiators. The retaining bolt over the cooler group are being a bit of a pain, as space is limited. The radiator lift will happen when 20118 is up and running and all is ok. The new exhaust stack has arrived in kit form and is slowly being put together. We had to have two produced as a minim order. So if any one knows a group who is in need of one, then a sale could take place. If all goes well in building the stack, we could provide the drawings. No change from last time. Loco was started up on 10th February after some time, and started first time. The set was started up at the end of March, with only one small coolant leak found on the radiator for No.2 engine on the Totnes end power car. The inside will need a good clean before use. Work is now on going in the second driving cab, with new panelling being refitted. No change from last time. Still body repairs, but it came out of the shed for a quick shunt on Sunday 20th January. Now back inside. Engine compartment has been repainted, cab windows are out for replacement and new rubber seals. All the marker lights now fitted to the front and rear of the loco are now working. 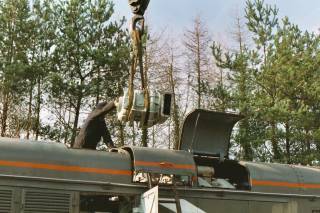 The new exhauster from Eastleigh works has been fitted in time for their AGM (06 April 2002). MINK - W 104700 - The strong winds in February has ripped part of the roof canvas. A replacement has been ordered and will be fitted as soon as possible. CCT - W94556 - No change, but showing signs of weathering. CCT - M94852 - NEW. Arrived from Plymouth Laira on late Thursday 21st March. This CCT will be for DMU spares. As it has racking built in most of it already. However, it will need some work doing to it, as it has some tin worm in it. At the moment it carries the old rail blue livery (faded), this will change in time. MINK `B' W125814 - Not a lot done due to all the wind & rain in the past months. LMS BG - M31927 - The Great Central Railway (North) at Ruddington have bought the remains so that they can put another body on to it. Moved by road transport to it's new home at the end of March. May 19th will see the use of two 20's and the 04. Mostly Sundays at the moment. If you turn up about between 09.30 and 10.00 someone will be around. But no guarantees on this. May 4/5/6th, the Thomas weekend. We have acquired a 110 volt battery charger from Exeter (surplus to requirements). During January a start on checking it over found that the wires insulation was breaking down where they were held together by tape. The sticky side of the tape had reacted with the insulation and at one spot was shorting across. Also the mains cable is looking very iffy and will be replaced and two small copper straps were found broken. A start on repainting it in March is planned. We have now two new spare power units that were surplus at B.N.F.L. Hinkley Point. They were standby/backup units which had been in store in a warehouse in Burrow Bridge Somerset some way from Hinkley Point. One unit is complete, but the other unit has a cylinder head off for some reason? Before any of the units can be put into a class 20 a lot of work must be done first, as the power units are back to front! On a class 20 you have three oil filters, the coolant water pump, along with some pipe work. The turbo's air inlet filter may need changing as well. 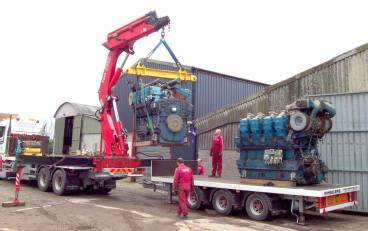 The two power units were loaded onto a lorry, along with some spares and special tools for transport to Buckfastleigh. 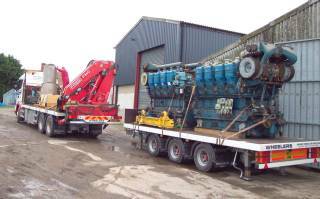 The power units have very low engine hours, around 500 hours. Compare this to 20110 which is now well over 9000 hours. At a date to be arranged in the summer, there will be a special run with the two 20's to say a thank you to B.N.F.L. for their kind gesture.